This famous quotation, from the 18th century English poet Alexander Pope, says it all. Creating a memorable garden is all about creating beautiful pictures. Think about it…suppose you are planning a new entrance garden. In your mind’s eye you imagine standing at the start of an elegant walkway leading at a stunning purple door surrounded by brightly colored plantings. And now you set out to create this picture. Of course the way your finished creation actually looks will vary according to the time of year, but you take this into account as you make your plans. The important thing, as you go about making your new garden, is to keep your mind’s eye focused on how you want everything to look when it is completed. 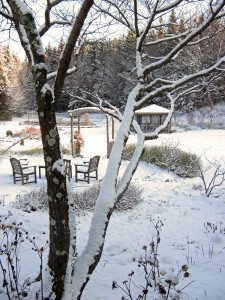 It goes without saying that our winter garden pictures will be different from our summer garden pictures. 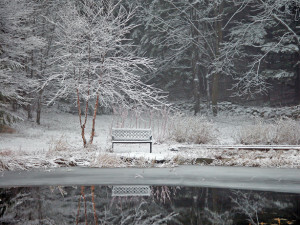 Winter pictures are primarily monochromatic, with a stark, spare elegance. At the north end of our little pond there is a garden bench beside a river-birch. It is always charming, but I especially like its winter image. This is how it looked in early January, 2005. 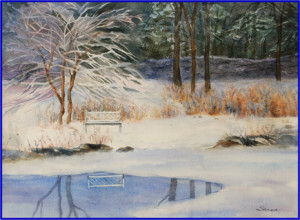 The ice shimmers with a dusting of new snow, and the reflections of the bench and the trees play on the open water. The woods behind are brooding and almost sinister, but the birch and bench have a lightness that pulls you into the composition. The following year this photograph became our Christmas card, and subsequently our artist friend, Christina Sanes, used it as the inspiration for her beautiful painting ‘Winter’s patterns’. And the pictures will change as your viewpoint changes. See how this plays out in my garden…. 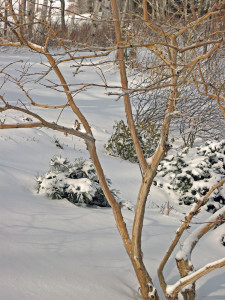 Sitting in my study at my computer, I see directly through the branches of the shrub, Seven-son Flower, (Heptacodium miconoides) to some snowy evergreen shrubs behind. About ten years back now, I planted this Heptacodium as an experiment. It came with a reputation as a rather messy shrub, but with a promise that, in early October it will have lovely 6-inch white flower panicles, to be followed by stunning rose colored fruit. Over the years I have found that this display all happens a bit too late in the season for Vermont gardens, typically happening just as winter’s frost makes its seasonal debut. But its winter demeanor, a very attractive mellow-yellow peeling bark, more than makes up for its flowering deficiency. And so my Haptacodium continues to earn a spot in my garden.. But when I look out of a different window in my study the view changes. 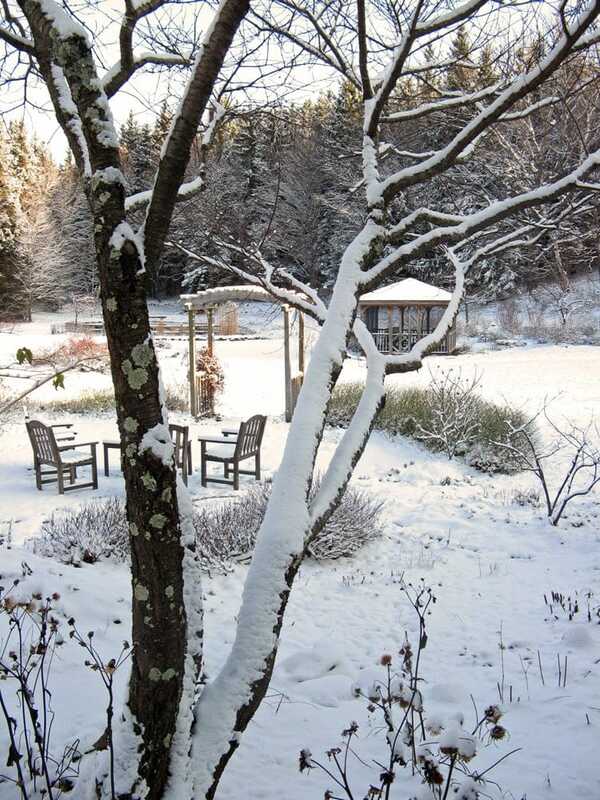 Now I see through the sculptural trunks of an old cherry tree, (pruned up so that I can see under its branches) to a group of dark chairs on the snowy patio, and continuing along the imaginary line that connects them to the centers of the arbor and the gazebo. And finally from the kitchen window we see that same arbor. But, since the angle is different, the picture has changed. 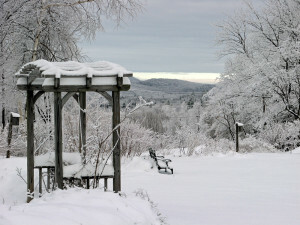 From this angle the arbor is silhouetted against the shrubs at the back of the perennial bed and the trees which frame the mountains beyond.